The Department for Work and Pensions has admitted that the quotes they presented from two benefit claimants extolling the virtues of sanctions were made up. 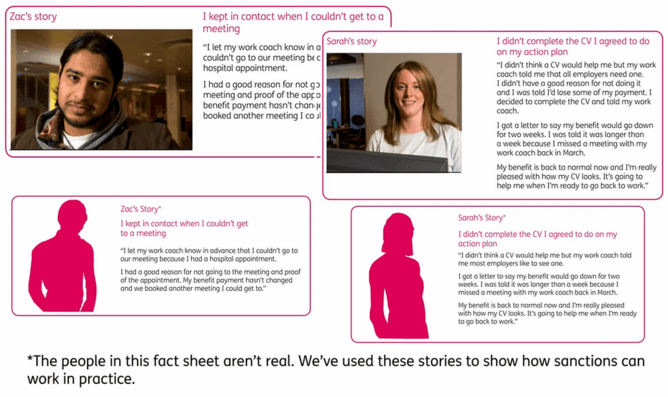 The DWP subsequently admitted that it had used stock photographs and that the words of both “Zac” and “Sarah”, were illustrative stories rather than the words of real people. The DWP has now withdrawn the leaflet altogether. The ‘illustrative’ examples used in a DWP leaflet. Leaving aside the criticism the DWP received, the story also raises important questions about the appropriate use of qualitative data, which draws on individual experiences as evidence. I am currently leading a major qualitative research project on the ethics and efficacy of putting conditions on welfare, and such questions are never far from my mind. The quotations and illustrative case studies that qualitative studies generate are powerful tools that offer insights into the varied impact of policy and practice on people’s day-to-day lives. For example, the two short cases below (drawn from preliminary analysis of our research), tell very differing tales about the impact of the sanctions (“sticks”) and support (“carrots”) that are key aspects of conditional benefit systems. Case 1 is an extreme example of the negative impact of sanctions on one person’s life. Case 2 offers a more positive example of the value of support rather than sanction when trying to influence people’s behaviour. I turned to prostitution. It was the most horrific time of my life. I got raped. I got raped. I got [hesitates] beaten up, raped and buggered, trying to [hesitates] earn money via prostitution. I was working with [two support organisations]. They were liaising with the benefits as well. It made no difference. I’ve never felt more confident. Now I’ve got my head screwed back on. I’ve got a job interview for [company] on the 17th through these guys. They’re interested in me. So hopefully, fingers crossed, I’ll be off benefits and back on proper money. Yes, that’s all I want. These case studies come in the context of a changing benefits regime in the UK. Successive governments of all political persuasions have enthusiastically endorsed a more conditional welfare state in which individuals’ rights to social benefit are increasingly linked to attendant responsibilities to proactively seek paid work, engage in compulsory training or participate in mandatory work experience schemes. In recent years these requirements have been extended to previously exempt groups such as lone parents with young children and disabled people. Those in favour of such welfare conditionality believe that individuals who refuse to behave responsibly and undertake job search activities or training as specified by Jobcentre Plus staff or Work Programme providers should face sanctions – i.e. have their right to benefits reduced or removed. In October 2012 a new tougher sanction regime was introduced and some claimants can now face up to three years withdrawal of their right to benefit if they repeatedly fail to “comply with the most important jobseeking requirements”. The use of sanctions has increased significantly with in excess of 900,000 Jobseekers Allowance claimants in April 2013 and March 2014. Supporters of sanctions see them as a necessary and appropriate “stick” within the benefits system to help cajole reluctant individuals into work and reassert a work ethic among welfare dependant claimants. Critics meanwhile point to the hardship that sanctions cause, a lack of evidence about their effectiveness in moving people off benefits and into sustained work and the punitive and often flawed way in which sanctions are applied for even relatively minor offences such as being late for an appointment. It is against this backdrop that the DWP’s decision to make up examples hit the headlines. At present my research team on the welfare conditionality project is involved in analysing 480 qualitative interviews undertaken with a diversity of welfare service users who’ve been affected by a range of policies. When using this data we are aware of both the ethical responsibilities we owe to our respondents (such as protecting their anonymity) and also our responsibilities as researchers to respect the voices and views of those we interview when interpreting the data that emerges in the fieldwork. While I can’t claim that the two quotations I have presented here are typical outcomes (we’re some way off reaching our research conclusions), they are real words, spoken by real people living at the sharp end of our conditional welfare state. It is the responsibility of all who use qualitative data to support arguments for, or against, the use of sanctions, or any other policy for that matter, to be open and clear about its provenance. Simply making things up because it suits a particular purpose is unacceptable.